Totally going to talk about my health for a little bit but you’re welcome to scroll down to the next photo where I start talking about these amazing chicken wings! 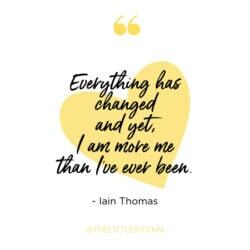 For the last few weeks, I have been hiding from you, my blog and from my friends. It’s a frustrating thing but I have a habit when I’m not feeling well to close myself off and isolate myself. And it makes it all worse. I have not been feeling well again. I have been dealing with a chronic cough off and on for over a year now. 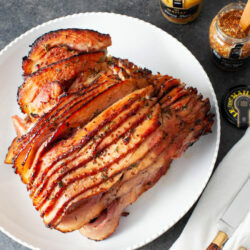 I realized that I mentioned it when I shared this recipe last July. This cough has taken over my life. When I’m overcome with a coughing fit, it takes over my whole entire body. Sometimes, it’s hard to breathe and sometimes I end up gasping and it ends in a sneeze. Oftentimes, I’m coughing so hard, I end up sweating profusely. The annoying part is the dirty looks I get in public, when I’m at the grocery store or while I’m traveling. I feel like the looks are saying, how dare you leave your house? You better not get me sick! A couple of weeks ago, while I was on a flight, a not-so-gentleman turned around and asked me to cover my mouth when I cough. I told him that I do (and honestly how would he know because he was sitting in front of me?). I explained that I’m not contagious and that I have allergies and asthma which was causing my cough. For the most part though, people are very nice, act concerned and often offer me cough drops. Lately, I’m not wanting to go anywhere or do much because this cough is very tiring and I feel like it’s gotten worse. Not only is it frustrating because it’s gone on for so long but I feel physically and emotionally exhausted. Some days, it’s hard to get a lot done. I find myself apologizing to Curtis and others around me when I have a coughing fit…they thankfully say to me, why are you apologizing? Because I feel so bad…this is a huge disruption in so many ways. I can see the look of concern on Curtis’ face every time I cough, he shakes his head. He’s frustrated too but I tell him, I’m way more frustrated than you are. My doctors think my cough is a combination of my allergies, asthma and acid reflux. The last part, I didn’t really believe because I don’t really have acid reflux symptoms. But we want to rule it in or out so next week, I’m getting an upper endoscopy with Bravo. The Bravo part is they are attaching something to my esophagus to measure the pH level for 48 hours. This will be interesting! I have been actually thinking of reasons I could cancel the procedure for the last week but the last two days, I have been having the worst heartburn…and I’m not allowed to take anything for it because they took me off of the medications for acid reflux (they put me on them hoping it would relieve the cough) in anticipation for the upper endoscopy to eliminate the possibility of a false negative. My asthma has gotten worse too, I’m wheezing a lot which causes more coughing. The other week, Curtis convinced me to go to urgent care because the coughing had gotten so bad, I thought I had bruised a rib. I had to sleep on the couch positioned in such a way with pillows in front and behind me so it wouldn’t hurt as much. And I’m glad he did, they gave me a cough suppressant that makes it so I’m not coughing every second…but instead every few minutes. My allergy doctor recommended I start these injections called Xolair to help my allergy and asthma symptoms since they have become resistant to the medications they have given me. The cough doesn’t even respond to steroids and don’t get me started on crappy they make me feel. The injections require me to stay at the doctor’s office for 3 hours after the first injection and will require me to carry an epi pen with me wherever I go. There’s a rare risk of anaphylactic shock with these shots. Googling the words “chronic cough”, what I’m dealing with sounds pretty common…but I’m honestly scared my doctors won’t be able to resolve it. And I guess, I’m scared it’s something way worse too. I’m beginning to feel like my chronic cough might be caused by all three things that they think it is: allergies, asthma and acid reflux. My cough is not always the same, sometimes, it feels like a postnasal drip cough and a cough drop helps. Sometimes, it’s coming directly from my chest and I can hear stuff rattling around. I also have sleep apnea and this all seems to be interconnected. I recently discovered bee pollen and am also eating local raw honey every day…hoping this will help in the long run. I’m hoping you have some advice or have gone through an upper endoscopy or have had Xolair injections? I would love to hear your advice and any related experience. Thanks so much! I love chicken wings! 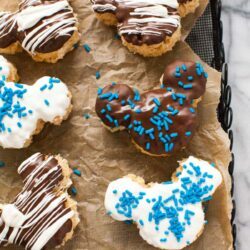 And baking them using my friend, Joanne’s technique is my favorite and only way I use now! Right after I added the chicken wings to the boiling water. The water calms down but it will come back to a boil again. After you boil them, you’re going to carefully dry them. They need to be bone dry (haha) so the skin crisps up nicely in the oven. 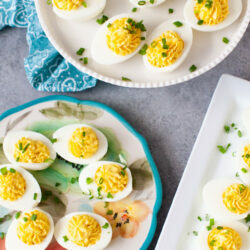 Place them on an uncovered baking sheet and bake for 20 minutes. Flip them over and bake for another 10 to 15 minutes. 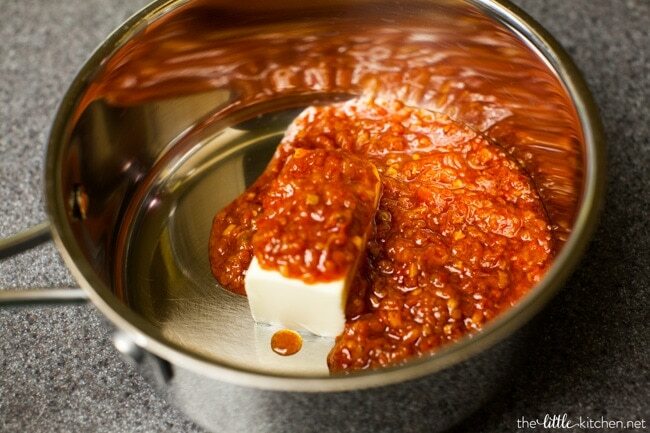 While they are baking, make your sauce! Mina graciously sent me their Harissa sauce to try out. 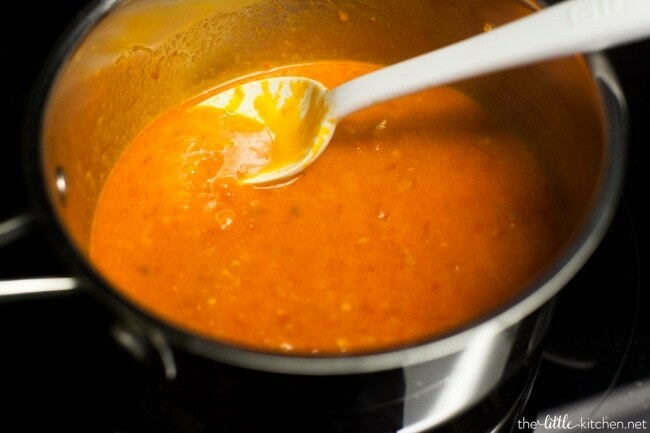 I love the spicy sauce but you can make it with the mild sauce too! I love the color of the sauce after the addition of butter! 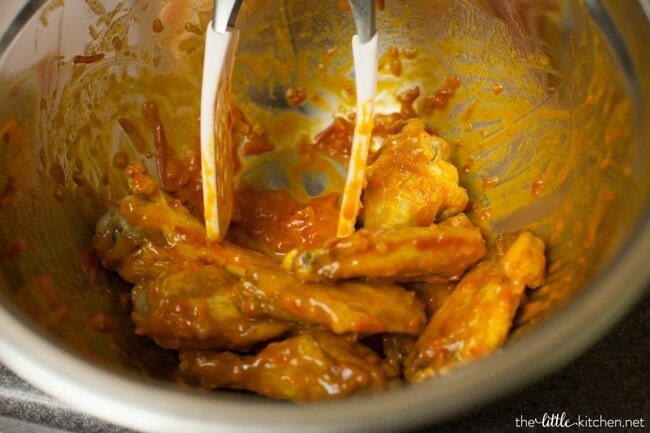 Every wing sauce needs butter! 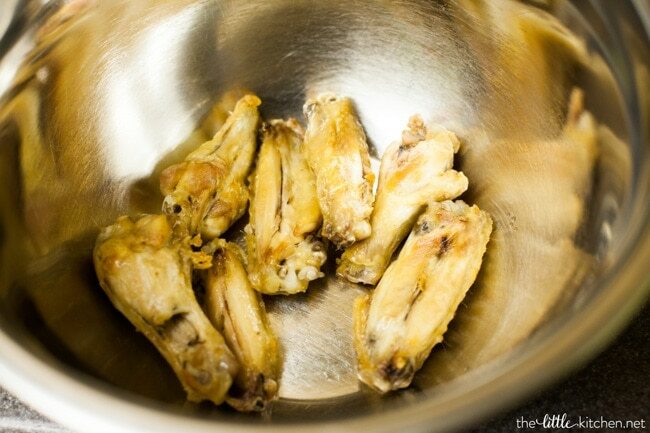 Put some wings in a bowl. 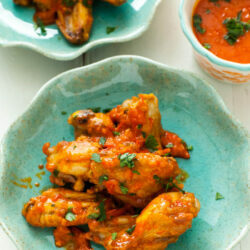 Wonderful spicy or mild red pepper buttery sauce wings. 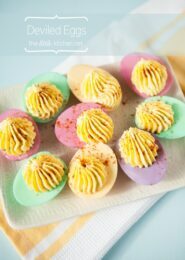 I know you’ll love these…so easy to make and only three ingredients! 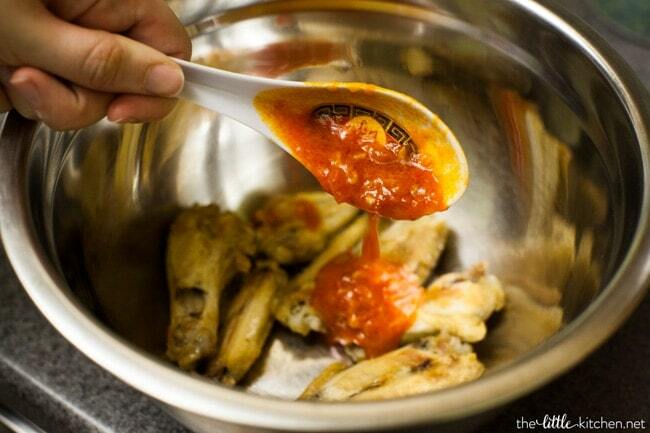 Carefully add chicken wings to the boiling water, once it returns to a boil, set your timer for 8 minutes. Drain and place on an uncovered baking sheet. 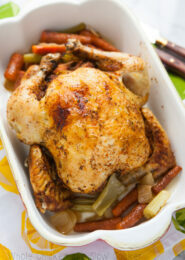 Use a paper towel to dry them completely, being very careful because the chicken is hot. There should be no moisture left. 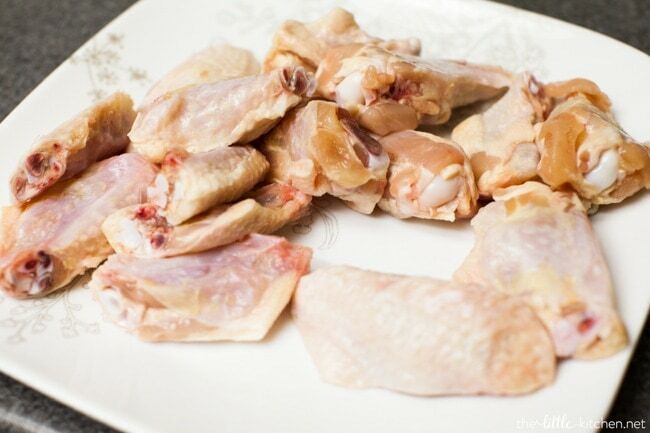 Discard paper towels and place chicken wings 1/2 to 1 inch apart on your baking sheet. 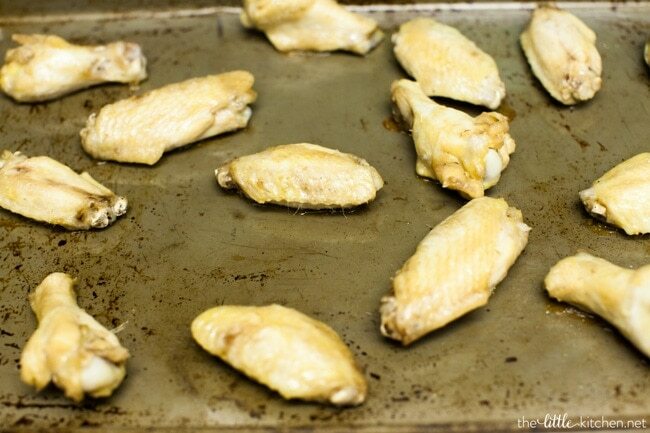 Bake for 20 minutes and then flip each wing over. Bake for another 10 to 15 minutes. 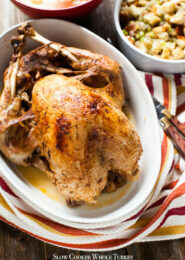 While the wings are baking, add butter and sauce to a small saucepan. After the butter has melted, mix together thoroughly. Cook for another 2 to 3 minutes. Or while the wings are baking, you can microwave the sauce. 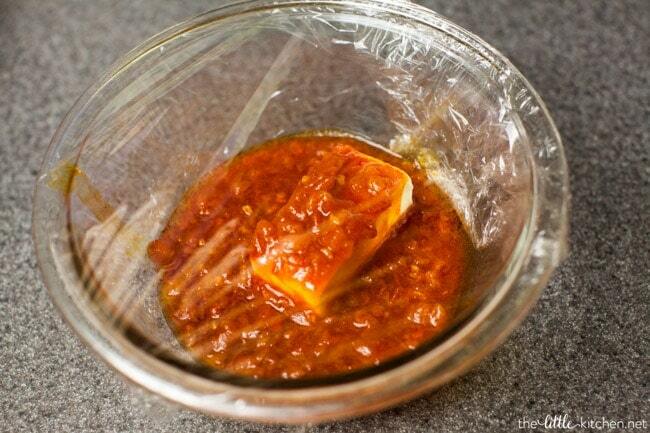 Add butter and sauce to a microwave-safe bowl and cover with plastic wrap. Microwave in 30 second increments, about 1 minute 30 seconds, until butter is melted. 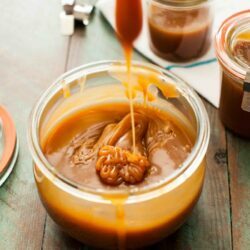 Open plastic wrap carefully and mix together thoroughly. Disclosure: Mina sent me some of their sauces to try out. I was not compensated and all opinions are my own. I’m so sorry about the cough! I haven’t used Xolair or had an endoscopy, but I had a cough for months as a side effect of a medication that convinced my body I had the flu all the time. So mine was post-nasal drip, for sure, and the one thing I’ve found that helps with it is peppermint Altoids. They’re not perfect, and I was entirely sick of mint by the time it let up, but they made a big difference. Cough suppressants do exactly nothing for me. :-\ So that might at least help with the times when it’s the post-nasal-drippy sort of cough. Glad your cough is resolved…I might try the altoids, LOL. The suppressants work up to a certain point but don’t get rid of it, unfortunately. 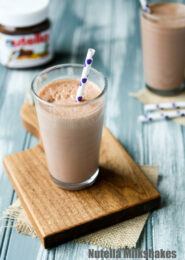 Hope you enjoy the recipe and thanks for your words! I am not familiar with the injections or the pH test, but I know some meds cause cough like those for high BP. And with a chest rattle I would insist on a chest CT and a pulmonology consult. Good luck. Thanks, Antonia! I actually go to a pulmonologist for my sleep apnea (he has a specialty in sleep medicine)…so I’m going to ask him about all of this and the chest CT! I am so sorry you are struggling with the coughing. My mother has a chronic cough and has been struggling for 20 years. She goes through cough drops like crazy. She cannot take any of the medicines they can offer because she has allergic reactions to them so no help for her. Her cough is caused by allergies and acid reflux, like you she has not ever had heartburn symptoms. She can no longer sing and she won’t go to church, movies or concerts for fear of bothering people with her cough. She feels very isolated. I hope you can find some help! My mother used to drive herself and everyone else crazy with a continuous cough. Doctors kept saying it was nothing. Finally one doctor decided to see if he could figure it out. It turned out she had an ulcer. The doctor said it was the worse one he’d ever seen. Probably because of the years of neglect. They fixed the ulcer and she never coughed from that again. It was a huge relief to everyone. You might ask if that could be the problem. If you have an acid stomach, I highly recommend an upper GI (endoscopy). An acid stomach does cause coughing and even erode your teeth. I’ve had both issues. My upper GI showed both a gastric ulcer (not caused by H. Pylori) and Barret’s Esophagus, a precancerous condition. I’m now on an ion pump inhibitor and worry about the long term effects. (ten years and counting.) Still, I feel much better when I take it daily. It becomes a problem if I miss more the one. The upper GI was mildly discomforting. Much, much less so the a colonoscopy. Very little prep, just don’t eat for while or drink for even a shorter while. No general anesthesia. It’s really a piece of cake. It feels a little funny. No worries. I also have COPD/asthma and sleep apnea. I use a BiPAP with O2 push. I like it a lot. I feel more rested. I can’t speak to allergies. To my knowledge, I’m not allergic to any common triggers. I looked up Xolair since I was not familiar. I might mention it to my doctors. It looks like it might help you on more than one issue; that’s always a plus. Still, I have enough other issues…. I wish you well and hope I may have allayed some of your fears. I’ve had about a dozen endoscopys. Nothing to worry about if you have a good GI Doctor. You should be out for this procedure. My acid reflux turned into Barrets esophagus. Monitor this very closely. I stupidly neglected this for a few years and it turned into Esoughageal cancer. I’m fine now. Please take care of yourself. Good luck to you and my very best wishes. Please keep us posted on how your doing. Very sorry about your chronic cough. Good luck with all your tests. I really can’t give you any advice. My daughter had asthma and had a chronic cough prior to being diagnosed. We had her tested for allegies too and she was allergice to dust mites…ugh…so we encased all her bedding in dust mite proof bedding, eliminated all carpet in the house, got her a hepa filter and then, set about with all these allergy shots and asthma medication…..it seemed overwhelming at the time, but it really wasn’t. Even if you don’t have allergies, some of these might help you. I also washed all her bedding in hot water every week and took to vacumming with my Oreck every day. Good luck and hoping you will find out the source and feel better soon. It is exhausting….thank you for sharing your story, Sending special thoughts your way. These wings look AWESOME. 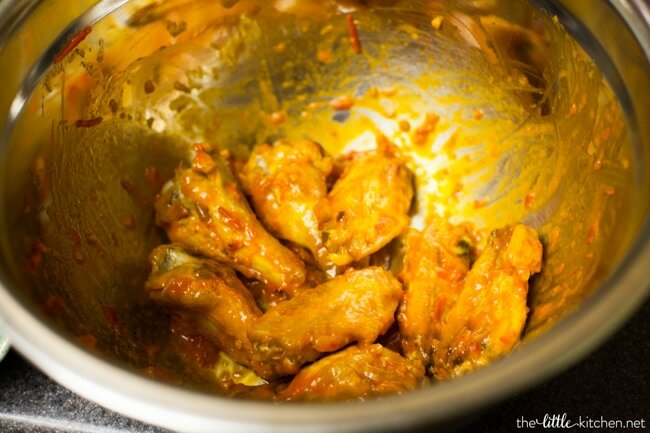 I love that method that Joanne has shared, it’s my preferred way for baking wings too. 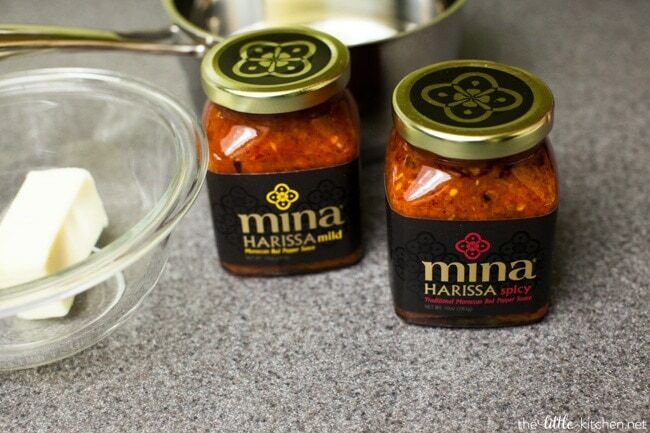 This harissa version sounds fabulous! 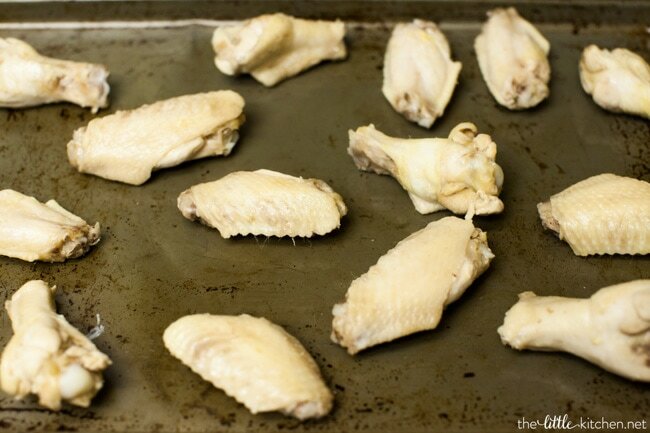 I love how you make recipes like chicken wings so fancy!! 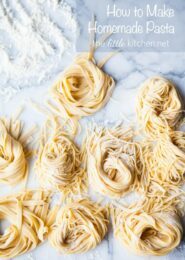 You are a great cook, Julie, and I love your ideas. I completely feel for you! I’ve been coughing everyday since February. I know it’s not the same as an entire year, and I can imagine your exhausted and frustrated and probably a little scared. If I hear of anything that helps, I will pass it along. i could really relate to the avoiding going out in public, the tendency to apologize, and the wheezy, junky chest rattle! Ugh! I have been consumed with trying to “get stuff up” out of my chest. Just so you know, you are not alone and hopefully, this will be a memory of a bad, unhealthy year and it resolves itself. 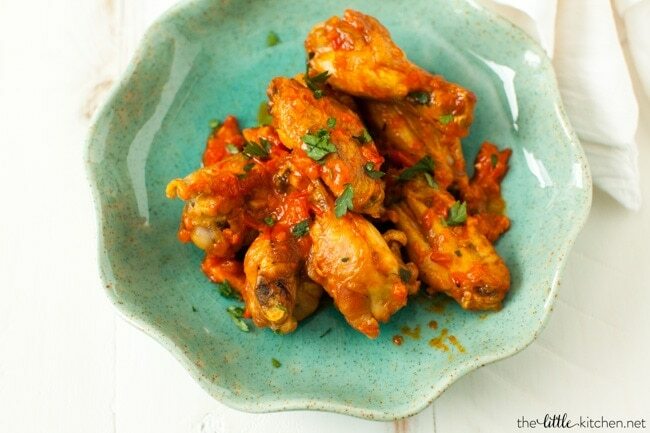 Harissa wings… YUM! Just bought a jar of this same harissa and can’t wait to use it. 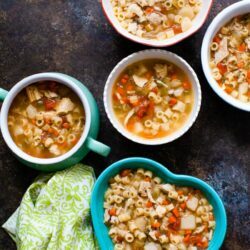 Was looking for Harissa recipes and found this one. 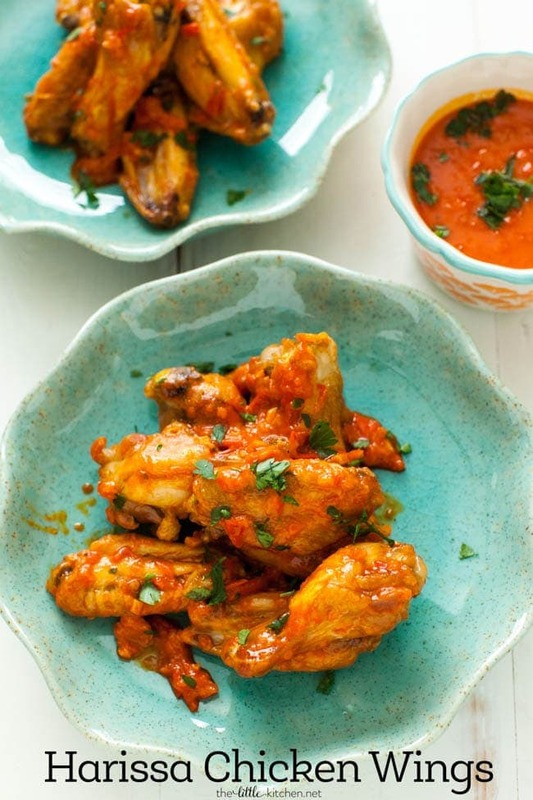 Can’t wait to make these harissa wings! 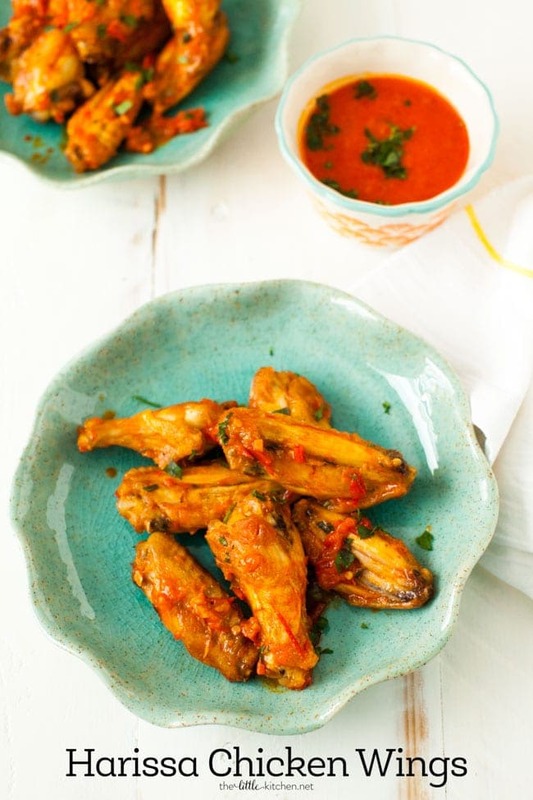 Love this harissa chicken wing recipe. 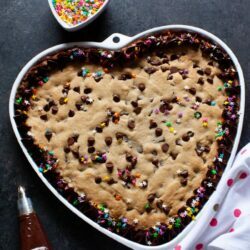 Making them this weekend. harissa is our new fav hot sauce. BBQ harissa wings are also being made!